British Prime Minister, David Cameron leaves 10 Downing Street in London, Britain, Sept. 7, 2015. Cameron will address Parliament on Britain's response to the migrant crisis in Europe. The British air force killed three Islamic State militants in Syria, including two Britons, in the first such attack last month, Prime Minister David Cameron said Monday. Calling the August 21 drone strike "an act of self-defense," Cameron said there was "clear evidence of the individuals in question planning and directing armed attacks against the UK." Reyaad Khan and two others, including a second British citizen, were killed while traveling in a vehicle near the de facto Islamic State capital of Raqqa, Syria, Cameron told parliament. While Britain participates in anti-Islamic State strikes in Iraq and uses unmanned aircraft to gather intelligence in Syria, the Royal Air Force had not targeted Islamic State militants in Syria until the August strike. An estimated 500-600 Britons have traveled to fight with the Islamic State group alongside thousands of other foreigners as the militant group forges what it calls a "caliphate" across parts of Iraq and Syria. To that end, the Britain-based Syrian Observatory for Human Rights on Monday said Islamic State fighters seized the last major oil field held by the Syrian government, Jazal, in the country's central desert. French President Francois Hollande speaks during his press conference at the Elysee Palace in Paris, France, Sept. 7, 2015. Like Britain, French forces are also ramping up their anti-Islamic State actions in Syria. President Francois Hollande said that France on Tuesday will begin surveillance flights over Syria ahead of possibly joining the U.S.-led coalition of countries conducting airstrikes against Islamic State militants there. 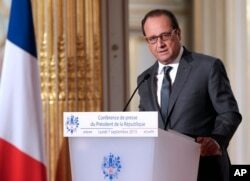 In a wide-ranging press conference, Hollande said the flights aimed to find out what actions the Islamic State group was preparing against France and its allies — and against the Syrian population. But he said it is "inconsequential and unrealistic to put French ground in Syria, where government troops, rebel fighters, al-Qaida-linked forces and Islamic State militants are all battling for territory. The French president spoke as thousands of Syrians and other refugee seekers continued their march toward Austria and Germany, after having crossed the Mediterranean Sea to safety. 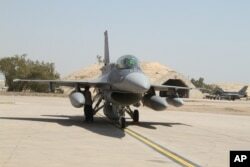 FILE - U.S.- made F-16 fighter jets stand on the tarmac upon their arrival to Balad air base, 75 kilometers (45 miles) north of Baghdad, Iraq. The U.S.-led coalition continued to target IS positions overnight, with four airstrikes in Syria and 11 in Iraq. On the ground, Iraqi troops and militias continue to battle Islamic State fighters for territory. Al-Obaidi escaped a sniper attack unharmed as he traveled in a convoy on Monday. It is unclear if the minister was the target of the attack. One of the minister's guards was wounded by the gunfire, according to an official statement. ​Al-Obaidi was returning to Baghdad after visiting troops near Beiji, home to the country's largest oil refinery and a key IS target between the capital and the militant stronghold of Mosul.